things have been so busy! we missed posting on our year blog anniversary - can't believe how quickly a year of posting went by and we really love all the new friends we've made. also want to wish the "pictures" of pictures & pancakes a happy belated birthday - we had a wonderful new york day wandering the city, enjoying a cup of Stumptown coffee at the new Ace Hotel, a lovely dinner here and cocktails here. other than that, we've been on a little french toast kick . . . does two sunday mornings in a row qualify as a kick? i think so. there are some amazing bakeries in this city and i actually just worked on a bread cookbook (details to come) with two amazing women - photographer susie cushner and stylist randi brookman harris. baked my buns off (hee hee) for 5 days straight but fell in love with carbs again. french toast is such a quick easy treat - change the recipe to make it your own with different breads, spices and sauces and let me know what your new favorite combination is! we used this blueberry sauce which is also great on pancakes. enjoy! in a baking dish, combine eggs, milk, cream, vanilla, orange zest, cinnamon and salt. place 2 slices of brioche in mixture and let sit for 2 minutes or until bread soaks up some of the liquid but is not soggy. turn over and heat a griddle over medium high heat. cook each slice for 2-3 minutes per side or until golden brown and crispy. repeat with remaining slices. 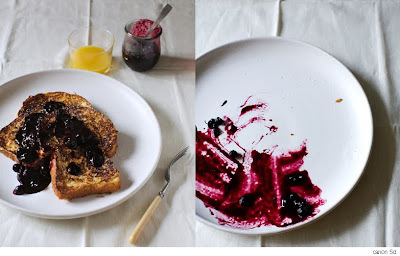 serve with a light dusting of confectioner's sugar, softened butter and blueberry sauce. happy belated bloggie anniversary! and glad you guys had a great time in NYC! I haven't eaten french toast for months. Time to do some toasting and eating! Just happened upon your blog and everything looks great. This looks like the french toast that I trek to whole foods for every weekend... I'll have to try it!